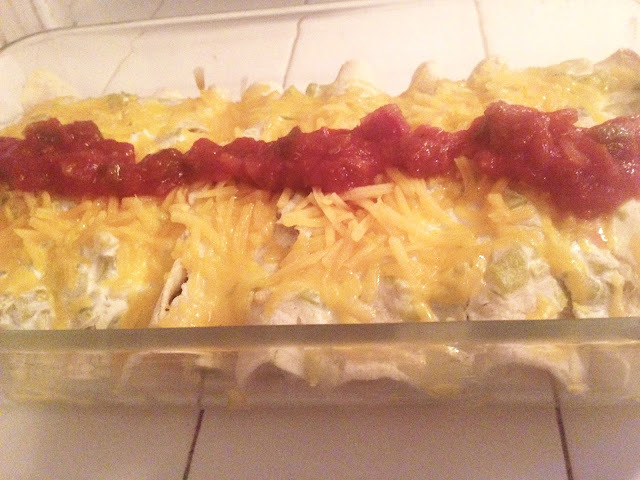 Amy's Creative Pursuits: What I Cooked This Week: Chicken Enchiladas, One Skillet Spaghetti, and a Pork Chops Recipe! What I Cooked This Week: Chicken Enchiladas, One Skillet Spaghetti, and a Pork Chops Recipe! "What I Cooked This Week" is officially a regular feature on my blog! Every Saturday I will share some new (or old favorites) recipes I tried that week and review them. None of the recipes are my own creations. I simply find a new recipe, cook it, and tell my readers what my husband and I thought of the dish. My first recipe this week is actually an old one I've made several times before. I just really like it, and wanted to share it with you all. It's called "Creamy Chicken Enchilada" and you can find it HERE. I absolutely love this recipe! It has a white sauce, so it's not spicy and more agreeable with my tummy. If you read the reviews, some people think it's kinda bland. I think it certainly can come across that way, so be sure to serve lots of salsa and other Mexican toppings on the side. I actually like the blandness is comparison to hotter/spicier Mexican dishes. But I'm also a sucker for white sauces! It is a healthier Mexican dish. It only has 247 calories per serving and 9 grams of fat. I probably upped that as I used regular sour cream and not light sour cream as the recipe calls for. The main ingredients of this dish are spinach and chicken...so if your looking for a healthier Mexican dish, then you might want to give this a try! My next recipe is a new one. My husband loves spaghetti, but I hate all the pots and pans needed to make spaghetti with a meat sauce, so when I saw everything could be cooked in one pan it intrigued me! 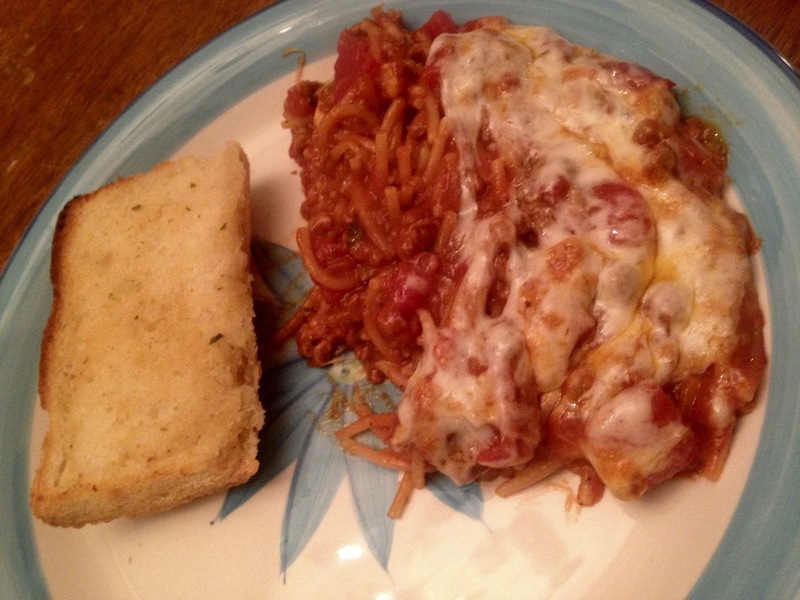 The name of this recipe is "One Skillet Baked Spaghetti" and you can find it HERE. O.k. I have to admit, I had my doubts about this recipe, could everything really be cooked in one pan, including the noodles? I had to try it and see for myself. After some trial and error, I discovered YES, everything could be cooked in one pan, and it was DELICIOUS! You start by cooking your ground beef in a cast iron skillet. Then you add all the rest of the ingredients...including uncooked noodles. I messed up by not reading the recipe correctly and used diced tomatoes instead of crushed tomatoes; so it was a bit watery. No problem, I just added a can of tomato paste to thicken it and it was great. I did find it slightly difficult to get the noodles to cook. You have to keep pushing the noodles beneath the other ingredients, which can be hard when they are crunchy! I also think I cooked my noodles twice as long as instructed; but we like our noodles very soft. Once all the noodles are tender, you sprinkle the dish with cheese and put it under the broiler. It turns out magnificent! My husband absolutely LOVED this dish! The sauce didn't have as much zing as we normally like, but we solved that problem by sprinkling a little pizza and pasta seasoning over our individual serving. If you can only try one new recipe this week, I urge you to try this one. It was fun not having a ton of dishes to clean up afterwards! 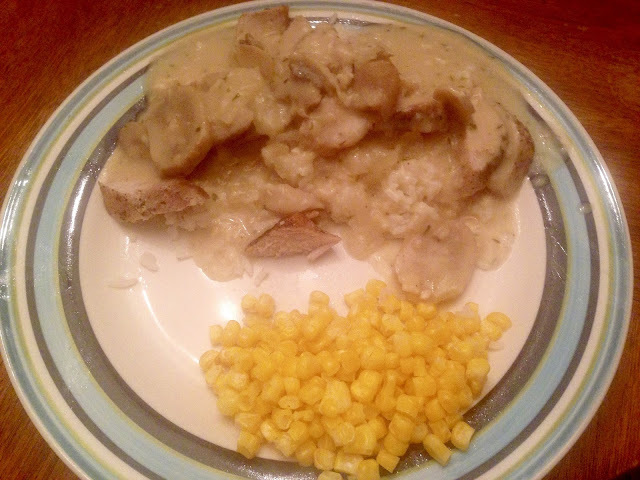 My last recipe is "Creamy Dijon Mushroom Sauce and Pork Chops Recipe" and you can find it HERE. My husband will eat pork chops, but he doesn't really care for them, so it's not something I make too often. I feel about the same, but I really love the price of pork...it's so cheap! So if money is tight one week, pork chops it is! My husband's biggest complaint about pork is that it tends to be on the dry side so he always prefers it with a gravy. So when I found this recipe, I decided to try it. I liked that everything could be cooked in one skillet. I forgot to take a picture of this recipe while it was still in the skillet, so all I have is my serving plate. I cut my chops up into little bite size pieces so they could be poured over a bed of rice a little better. I honestly found the gravy a bit bland tasting, I had to sprinkle my serving heavily with salt and pepper, but it does say "salt and pepper to taste" in the recipe. Other than that, for a pork chop recipe is was pretty good. It's a good hearty dish for a meats and potatoes man! We also love mushrooms, so we enjoyed that the most about this recipe. And on a side note, I finally started photographing my food with my DSLR, and boy that does make a difference in the quality of the picture! I unfortunately have a lot of food photos in my stash that were still taken with my IPhone (like the ones today), and I have to use those first in upcoming posts. But soon, you will see higher quality food photographs! What a delicious week of eat! I love a good one pot meal. Great to see you on Running in a Skirt this week. These look great, will definitely have to try the spaghetti meal! Our Visit to Sea World!